Writer Josh Stolberg, who penned Alexander Aja’s Piranha 3D and the Dane Cook vehicle Good Luck Chuck, turns his hand to both writing and directing with his take of the formulaic “hider in the house” story, entitled The Attic (aka Crawlspace). In a charming and quiet suburban town, Tim (Jonathan Silverman) and Susan Gates (Lori Loughlin) have found their perfect new house, and their lively daughter Kayla has just returned home from college to help with the big move alongside her brothers, Shane and Taylor. But behind the picture of suburban bliss is an altogether more sinister story. During the move, Tim reluctantly reveals his knowledge of the house’s dark past – the story of two small children who drowned in the pool and the parents who were forced to move out due to a foreclosure. As the family settles in to their new home, a series of eerie events begin to suggest that all is not as it should be. Unexplained footsteps, misplaced tools, electronics going haywire and sinister warnings from their new neighbour quickly erode their happiness as anxiety and fear gradually take over their lives. Unbeknownst to them, their cosy little home has an uninvited guest; the deranged previous owner, Alden (Steven Weber), has returned. Living in the walls and obsessively watching the new owners, as the last vestiges of his sanity disappear, his true intentions become horrifyingly clear. Over the years there have been plenty of hider in the house horrors – from the likes of Klaus Kinski’s Crawlspace to The Silent House, to the obviously titled Gary Busey starrer Hider in the House - so coming up with a new way to tell the same story is nigh on impossible. Which is why, instead of trying to add something completely new to an oft-told tale, writer/director Josh Stolberg relies on a fantastic cast to tell his version of this by-now-cliched story. Of course that’s not to say Stolberg doesn’t find the odd twist or two to add to his tale… For one, Stolberg casts against type, with Steven Weber – who typically plays movie good-guys – cast as the villain of this piece, a father who just cannot let go of his family home and the memories within and has a rather vicious way of greeting the new homeowners – meaning that The Attic features death by car window, garbage disposal, curling iron and Christmas decorations, just to name a few. I’ll admit Stolberg really knows how to craft one hell of an inventive death scene! “Final girl” duties fall to newcomer Raleigh Holmes (in her first feature film role), who is immediately likeable as the daughter returning home from college to find her family uprooted into a new home that has an unexpected tenant. Whilst the rest of the cast is rounded out by two 80s stalwarts as the parents who find their home under siege: Weekend at Bernie‘s star Jonathan Silverman and one of my favourite 80s teen actors, Lori Laughlin (Secret Admirer, Rad). In fact it was Loughlin who initially drew me to the film in the first place… Plus there’s a nice, albeit brief, cameo from David Koechner as a quickly terminated exterminator. I’m glad that The Attic is finally getting a UK DVD release (it has already played on Sky TV under the original title of Crawlspace) and I applaud 101 Films for taking the chance and putting it out. It’s just a shame to see that the film has suffered from the usual supermarket-friendly cover design that makes this look like every other low-budget title on the shelves. It’s not, in fact its head and shoulders above the typical supermarket shelf fodder and deserves to find it’s audience on DVD. 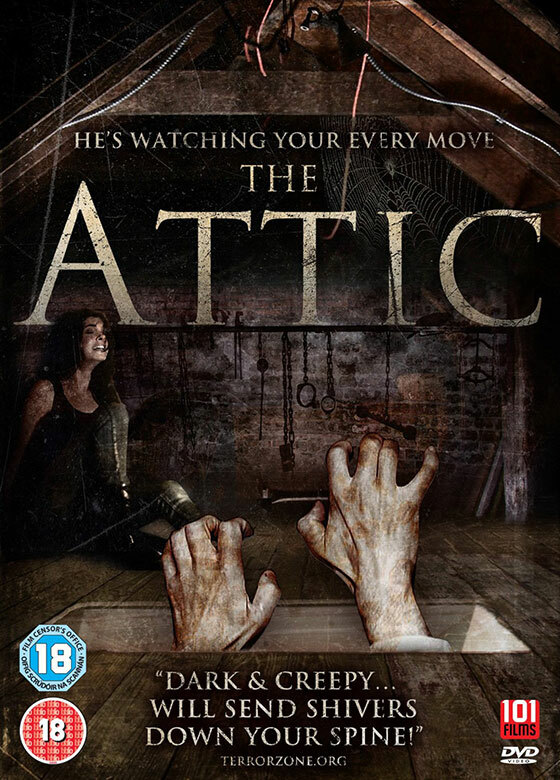 The Attic is out now on DVD from 101 Films.